On Saturday we advertised an update to the bicycle portion of our Transportation Master Plan and adopted Phase 1 of our Child Care Initiative. We have long needed the Child Care Initiative because our zoning and regulations were out of date, full of contradictions, and posed barriers instead of support to child care providers. I have watched in dismay as my daughters and their friends struggle with the same lack of social support for families that I experienced a generation ago, and I am delighted to see this overdue progress. I commend my youngest colleague, Katie Cristol, for spearheading this effort. It was quite timely for her personally. She participated in our meeting by phone because she and her new son were recovering from his early arrival. Happily, both are doing well. Major issues still outstanding for the Child Care Initiative are parking (staff will be back to us with some analysis of a more flexible ratio than they had recommended) and the ratio of childcare providers to children. From my own experience, I was very sympathetic to those saying one provider for 4 infants was too high, but ultimately swayed by the argument that our ratio is a floor only, and it is better to have families in regulated day care of 4:1 than in unregulated care. We began our hearing on our incentive agreement with Amazon at 1pm with an excellent presentation by our staff, commission comments, and then well over 100 speakers. We were expecting a large turnout of both residents and folks from outside Arlington, and we handled this meeting a little differently due to the number of people. The Fire Marshall strictly enforced the room occupancy, so many people were watching the meeting on monitors outside the Board room. I was disappointed by how many people continued to be uninformed about the agreement and uninterested in learning what the facts are…or, perhaps, were deliberately misleading people. 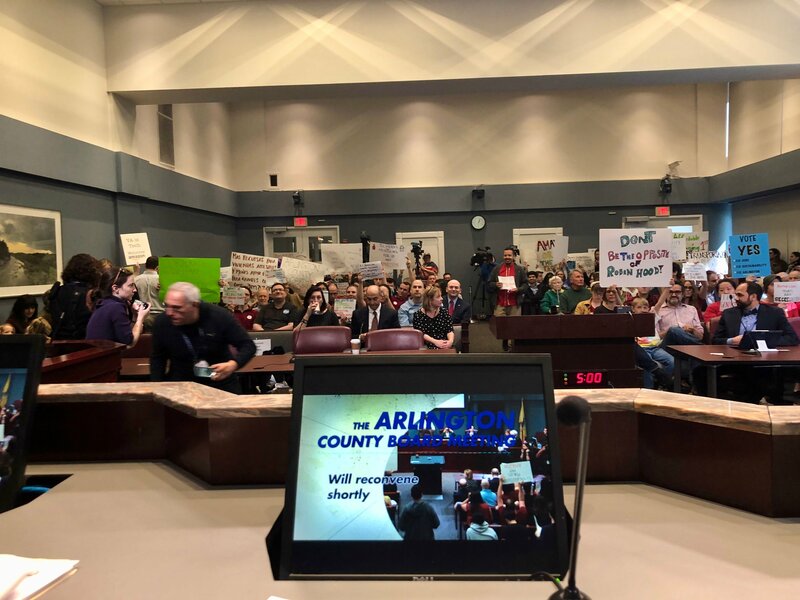 Portions of the crowd (including a number of people who were not Arlington residents) were at times rude to those speaking during public comment, but order was maintained. When the conversation turned to the Board after about 4 hours, representatives from Amazon came to answer questions. After about 40 minutes of questioning, portions of the crowd became loud and a few people very aggressive. Our chair, Christian Dorsey, called for a recess and the Board went to our offices in the back. We resumed our meeting, but it was difficult to control, and we recessed a second time when a man from Washington, DC became extremely aggressive and was removed from the room by police. I did not see this incident because I’d left the room, but some of you may have, as it played on local news channels. In our concluding remarks, we all had to pause at times for the room to quiet down. I talked about the changes I’d seen in Arlington over 40+ years and how we have been preparing for Amazon’s arrival for decades. Our vote was about far more than Amazon. 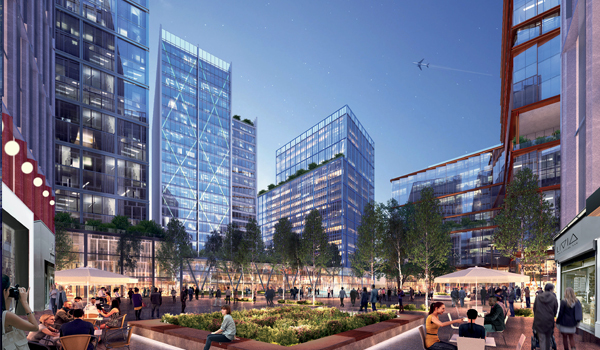 With the Tech Innovation Campus coming to Alexandria and the synergy Amazon will bring to Crystal City, this decision really was about the future of our region. I believe our region is transitioning to be the global leader of ideas and innovation that we should be. I am very hopeful many smart people will come here from around the world to work on solutions for the world’s problems and find solutions that work. If you can come to my book discussion with Evan Burfield on his book “Regulatory Hacking” tomorrow evening at Central Library, I think you will hear us touch on that idea. 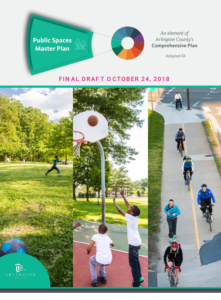 On Tuesday we advertised updates to the Public Spaces Master Plan, which is another major accomplishment of our staff and community working together. I also recapped my debate with John Vihstadt about whether County Board Members should be full time, rather than part time. I wanted to share my presentation with my colleagues because the more I looked at the issue, the more I have become convinced that we must transition to a full-time Board. Arlington now has a $1.34 billion budget, works regionally in many different organizations, and is becoming the center of the 7th largest economy in the world (the economic region that stretches from Richmond to Baltimore). 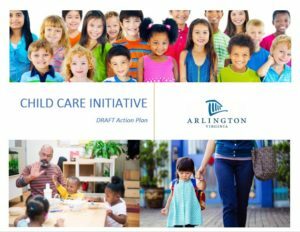 To expect 5 Board members to hold outside jobs to supplement our $55k salary while maintaining Arlington’s presence in the region and the Board’s connection to the multitude of civic associations, commissions, and organizations we have is, I believe, unreasonable and not healthy for our County. I am the last Baby Boomer on the Board. We cannot expect quality people with experience to continue to run for County Board, given the cost of living in Arlington today. I’ve talked to too many talented people who tell me they’d love to be on the Board, but they can’t afford it. As always, I’m happy to hear from you about issues to with any feedback on this newsletter. I hope it has been helpful.